It became a symbol for the Church, for the Kingdom of God, for the new heavens and earth. Jerusalem the golden. The holy city. The City of the Great King. Mount Moriah was there, where God stopped Abraham from sacrificing his son Isaac. Then known as Salem of the Jebusites, Melchizedek presided as its priest-king who encountered Abraham. The Israelites passed it by during the conquest of Canaan under Joshua. David conquered it and made it his personal capital — a city not belonging to any tribal inheritance, as the USA’s District of Columbia is outside any state. There David took the Ark of the Covenant to rest, the sacred symbol of Jehovah’s covenant presence. Also called Jebus and Ariel, Zion became its religious name, the City of David its royal designation. Solomon’s Temple adorned it for 300 years and symbolized it for 3,000 more. Nebuchadnezzar destroyed it. Zerubbabel and Nehemiah rebuilt it. Herod rebuilt its temple. Jesus worshiped in it, wept over it, was crucified outside it, and rose from the dead just outside its ancient walls. 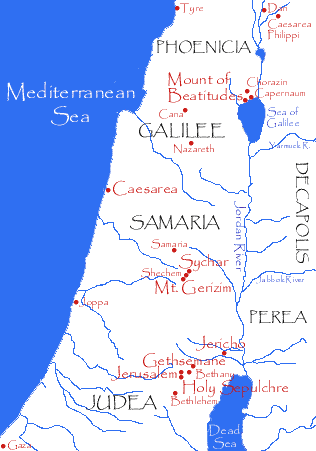 It was the birthplace of the Christian church, the site of the Spirit’s descent, the scene of the first half of Acts. A generation later, Roman Titus razed it to the ground. 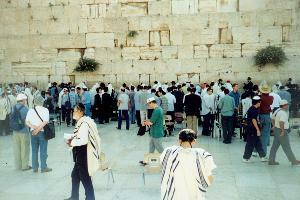 Diaspora Jews pray toward it, intercede for it, and pilgrimage to it. It became a symbol for the Church, for the Kingdom of God, for the new heavens and earth. Jerusalem the golden. The holy city. The City of the Great King. 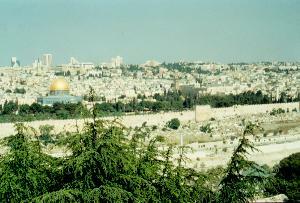 “We’re marching to Zion!” we sing, as we walk down the Mount of Olives toward the Western Wall. The golden sunshine sparkles off the golden building which predominates our view. But this is not Solomon’s Temple, or even Herod’s. 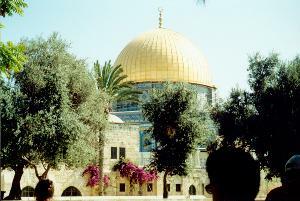 It is the Dome of the Rock, a Moslem shrine built between 688-691. 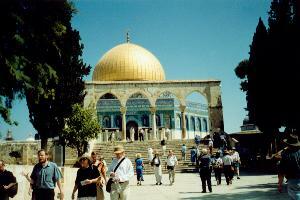 It is the third most holy place in Islam, a thorn in the side of the Jews, a puzzle and wonderment for Christians.